This labyrinth -- the Rose Park Labyrinth -- is a gift to the community of Macon from the Medical Center of Central Georgia, the MEDCEN Foundation, and The City of Macon. It is a peace park. It is a place for healing. It is free, and it is open all the time. 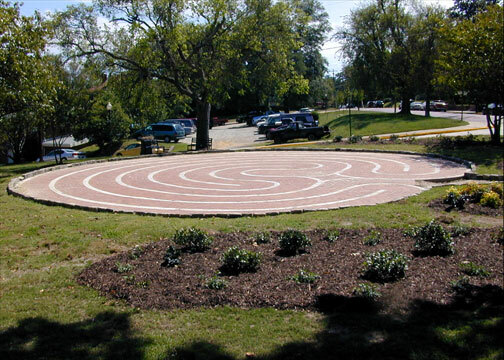 The Rose Park Labyrinth is located in Macon, Georgia at the intersection of Orange Street and Rose Street near Mt DeSales School. Dedication Speech October 9, 2001 Given by Dan Johnston, Ph.D. The labyrinth's path has a beginning and an end that are one and the same. In the walking, exploration of a labyrinth we always end up where we started, but as acknowledged by the English poet T.S. Eliot, "
the end of all our exploring will be to arrive where we started and know the place for the first time." Walking a labyrinth offers us the opportunity for reflection and meditation and the chance to become more aware of where we are in life, perhaps, an opportunity to come to "know" ourselves for the first time. And, finally, walking a labyrinth takes you down. Down to an inner place of peace, of rest, of relaxation. Down to insight, intuition, and creativity. A labyrinth has many gifts. On the surface its simple pattern is a thing of beauty. Slowly walking a labyrinth offers to unwind you from a stressful day, while a brisk walk may energize you. Since a labyrinth is not a maze, it has no dead-ends, it gives no problem to solve, and there is no task to accomplish. You can relax. Walking a labyrinth alone opens you to the possibility of gaining a new understanding and insight about who you are and about your place in the world. Walking a labyrinth with a group is a quite different experience and helps us to learn about the importance of community and to understand that in life there is only one path, and we are all on it together. In our apparent diversity there is a hidden unity that is emphasized by the one, winding path of the labyrinth that always leads us to a common goal. In order for a group of people to safely navigate the labyrinth and journey back out into the world, the cooperation of everyone on the path is required. Come and experience it. Take the labyrinth journey and see what you can discover about yourself, about your community, and about your place in the world.